I was deeply honored to be invited to Istanbul to write the materials for BASI Systems’ new line of Pilates equipment. I felt blessed for this chance to give something back to my teacher, Rael Isacowitz, who through his mentoring has lifted my strength, my confidence, my posture, and my spirit. And though I began my voyage with this aim, something quite unexpected was given to me. In a city that joins continents and breathes in the East and the West, I experienced the unification of two sides of myself. While writing of masterfully designed carriages, pulleys and push-through bars, I found my balance in Istanbul. 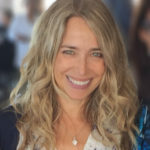 The project seemed tailored for me, combining my profound love for BASI Pilates® with my separate careers in product management (sixteen years) and teaching Pilates (thirteen years), which began when my business career ended abruptly after I suffered a near-death childbirth complication. The journey to Istanbul had a blustery start along with an auspicious coincidence. I contacted Ceylan Ucgun, the project director in Turkey, to warn her that Chicago had been hit with one of the biggest snow blizzards in its history and that most flights had been cancelled. She happened to be dining with a friend of the pilot of my flight who then contacted the pilot directly, and Ceylan assured me that I should go the airport. My husband made the valiant effort to get me there. Our car was the only sign of life on the road and everything was cloaked in thick, white snow. It was impossible to see where the land stopped and the sky began and I felt transported to another dimension before even leaving my hometown. We arrived to an eerily empty O’Hare airport, which I paced nervously until I heard that my husband had safely returned home. Then I sat back and waited until the flight finally took off at 2:00 am. I arrived in Istanbul to torrential rain. It was late at night and despite the weather Seda Gulmez, Marketing Director for the Istanbul team, was waiting for me with a car and driver. She escorted me to my hotel and waited until I had my room key in hand before kissing me good night and assuring me that she would be there to drive me to the factory in the morning. Duran Machinery (factory pictured above) partnered with BASI Pilates to develop BASI Systems Pilates Equipment. 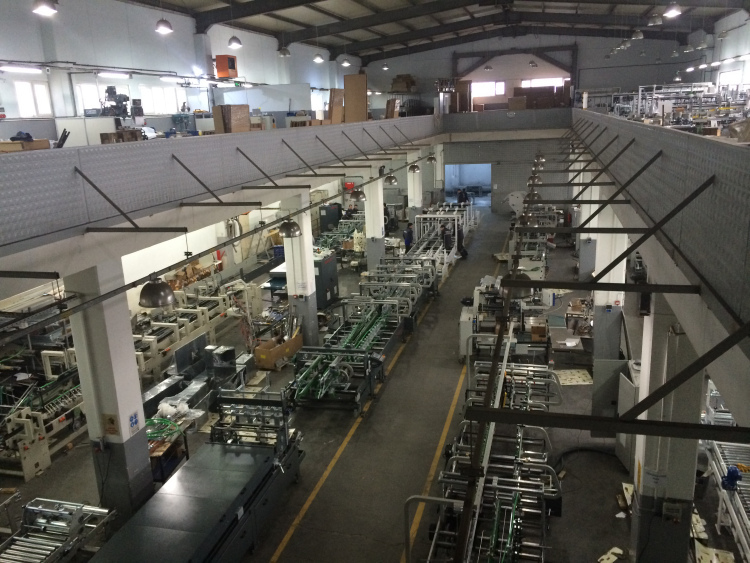 The next morning, Ceylan walked me through the factory, which is impressively large, modern and meticulous. Art is displayed on the walls throughout the building, bringing beauty and creative inspiration to the work environment. Ceylan is the third generation of her family to manage the business, and a feeling of family permeates everything, from her relationship with each of the company’s 120 employees, to the homemade-style lunch served to everyone daily. Oktay Duran, Seda Gulmez, me and Ceylan Ucgun at Duran Machinery Factory. Ceylan opened a door at the top of the stairs to reveal a large room where the Pilates equipment stood as if awaiting release into the world. Everything was there: Reformer, Reformer with Tower, Reformer Combo, Cadillac, three different Barrel configurations, Wunda Chair, two Wall Unit products, a Ped A Pull, and the innovative F2 System™ that could expand everything with new dimensions of repertoire possibilities. Ceylan invited me to become familiar with the equipment. Some features were immediately apparent, such as the reformer track’s additional length, and the newly designed pulley and gear systems that offer unprecedented flexibility in rope height and angle, and in spring settings. The carriage cushion covers the entire width of the reformer (a brilliant idea) and has extra padding for comfort (wonderful for kneeling exercises). The carriage ride is smooth and silent, and Ceylan explained that the Engineering Director is an actual rocket scientist who used NASA-grade aluminium in the reformer frame. The Reformer is part of a full system that can be expanded to a Reformer with Tower or Reformer Combo for full Cadillac functionality. I was excited that the legs do not have to be attached to the Reformer Combo or Cadillac. Finally, a Cadillac available for those with lower ceilings! Enjoying the smooth movement of BASI Systems Reformer at the factory. The equipment perfectly extends BASI Pilates principles of precision and flow. The Wunda Chair’s higher pedal offers greater mobility, and the springs can easily be changed with one hand from the front of the chair. Even the details made me smile, like the split pedal rod that sits flush in the pedal, eliminating the hazard of those that jut out from the side of a pedal. There are three Barrel configurations that take on a new life when used with the F2 System™, where springs can be attached independently or simultaneously from a multitude of angles to a barrel and coordinating sitting box to offer expansive repertoire possibilities. In my training with Rael, I’ve become familiar with how every aspect of his repertoire is purposeful, meaningful, and precise – and I was excited to see his approach brought to life in the equipment. 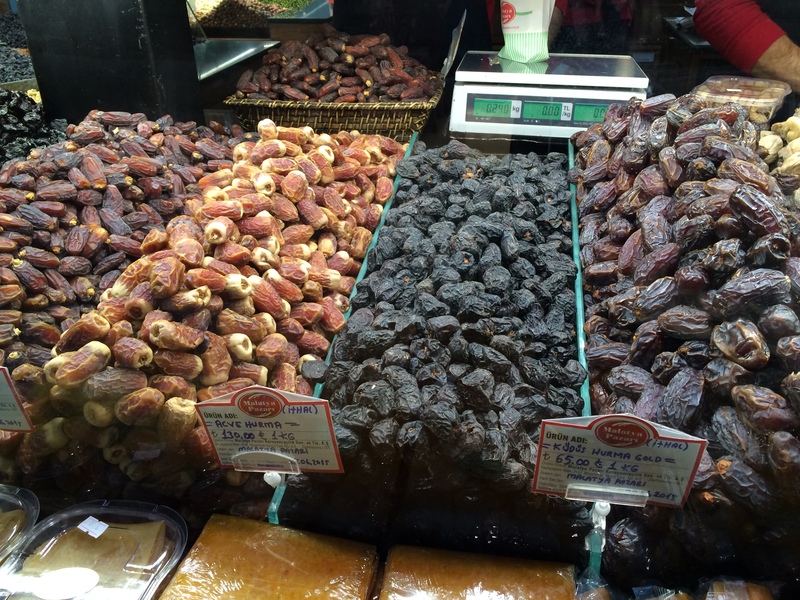 Ceylan and I discussed every detail of the products. I was impressed by her appreciation for function, craftsmanship and aesthetic and the effort that had been made to research the finest, environmentally friendly materials for longevity, smooth movement and comfort. Even the shipping box was specially designed to fold flat to be reused if the equipment is later moved. Engineering Director, Mr. Servet, his assistant Atom, and Chief of Production, Ozgur joined our discussions and encouraged my product feedback. I was struck by the love and care given to each object and how they perfectly embody the design intent. 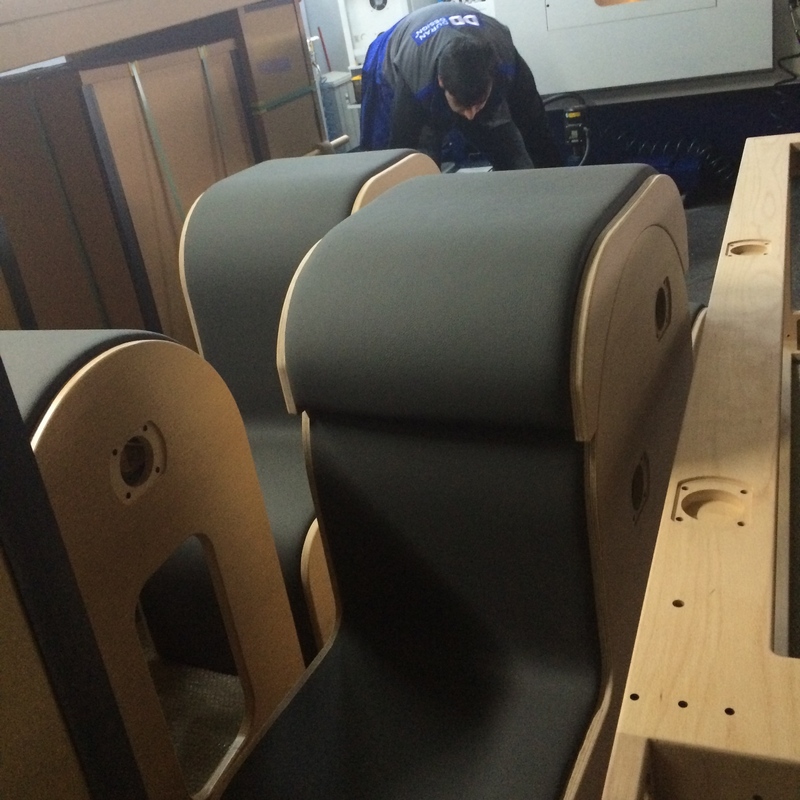 Each piece of equipment is built by hand. These Barrels have multiple slots where F2 Systems™ can attach and offer expansive repertoire. I had one week to complete marketing positioning and assembly manuals for twelve products. I looked at everything from the perspective of both a Pilates teacher and a Pilates mover, and the approach each may have with the equipment. I couldn’t sleep and stayed up writing every night. And each morning as I heard the call to prayer rise over the city, I stood at the window and listened. Even as a Jewish American woman, I felt the vibration of the Muslim call to prayer resonate with something within me, and it was a beautiful way to start the new day. 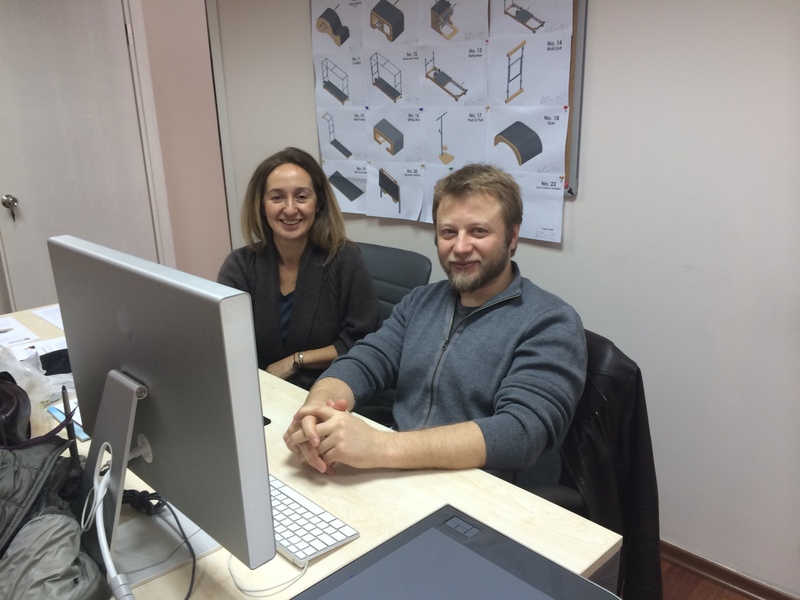 Every day Seda and Husnu worked their magic with layout and design of the previous night’s writing. Throughout the week I was cared for graciously. Seda picked me up each morning at my hotel. I had not wanted my vegan diet to be an imposition so I ate the wonderful homemade foods offered. But as the week progressed, I did not feel my usual self and mentioned some of the foods that I should resist. I was speechless the next morning to find my desk filled with fresh fruits and vegan meals that Ceylan had ordered from a local caterer. And her husband, Cengiz Han Ucgun, made himself available without mentioning his three-hour round trip travel to the factory. 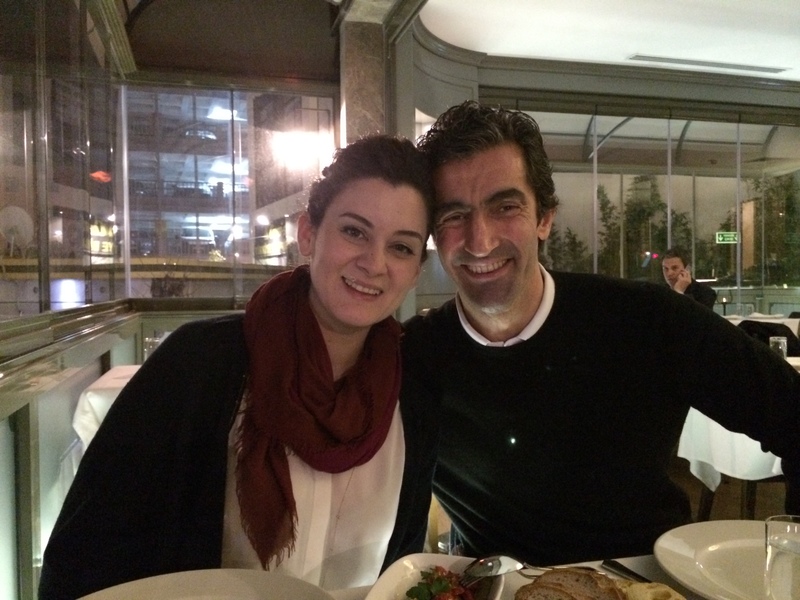 My lovely hosts, Ceylan Ucgun and her husband, Cengiz Han Ucgun, BASI faculty and owner of BODYNETWORX. 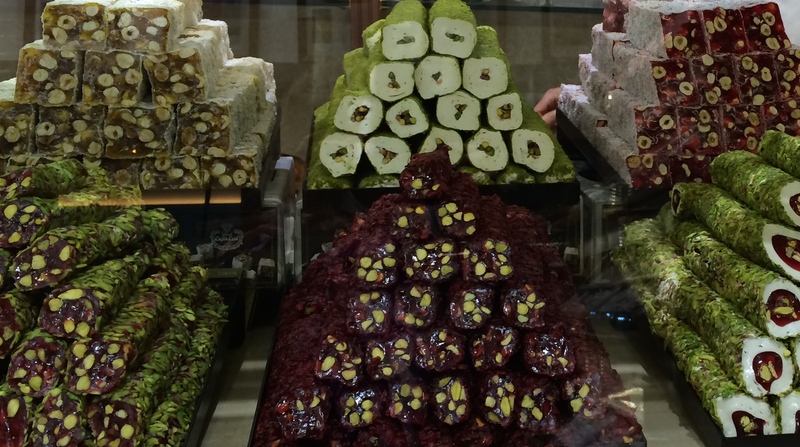 I enjoyed daily snacks of hot tea and Turkish Delights with fresh rose petals, saffron and pistachios. Sunday morning arrived and the first drafts of the materials were complete. After a week of uninterrupted focus and concentration, Ceylan and I shared a day of pure joy exploring her city. 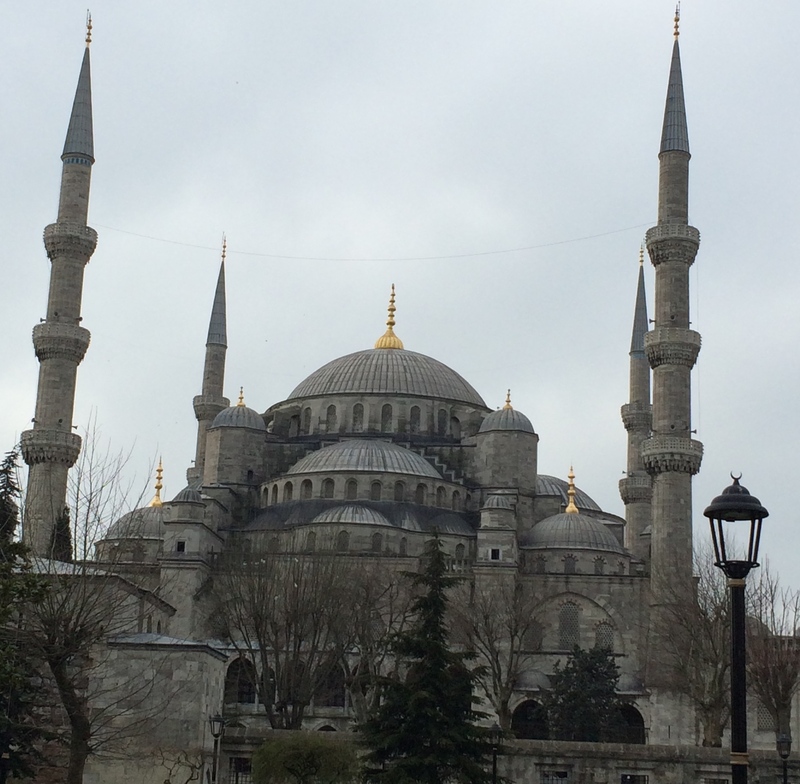 We started at the Blue Mosque, where we stood silently and took in its beauty and serenity. 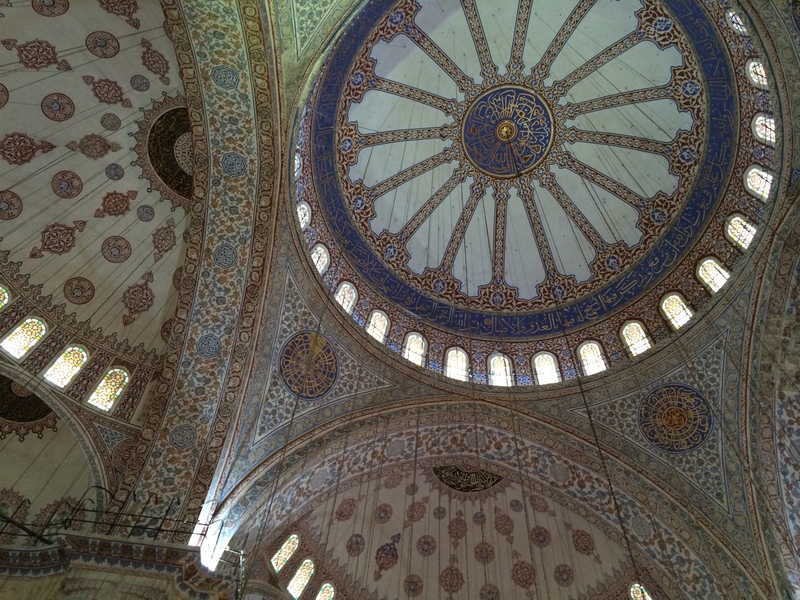 The Blue Mosque was built in 1609 and is still an active mosque. The ceilings are intricately patterned and surrounded by domed stained glass. 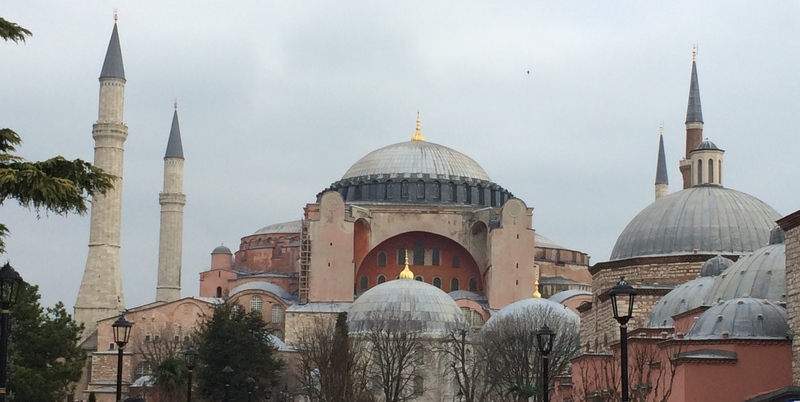 Next we visited Hagia Sophia, a church built in 537, converted to a mosque in 1453, and made into a secular public museum in 1934 by Turkish President, Ataturk. Hagia Sophia was the world’s largest cathedral for nearly a thousand years. 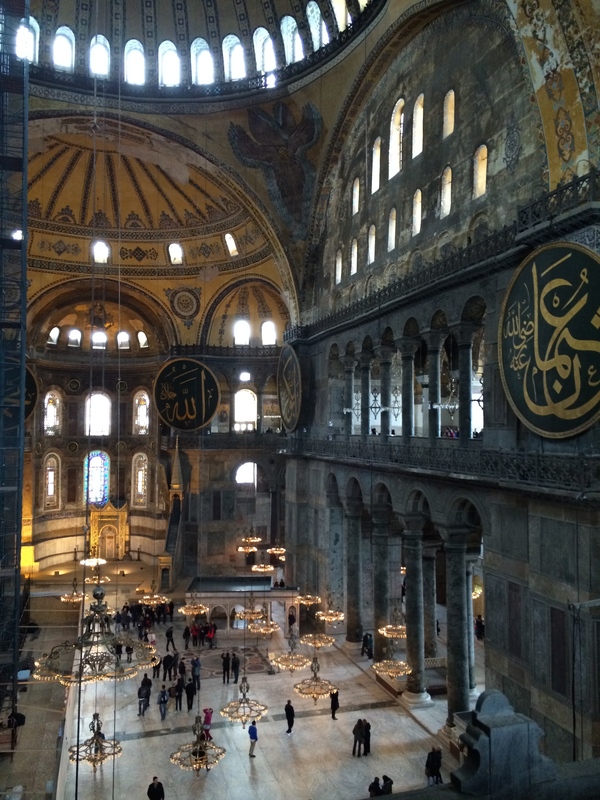 In Hagia Sophia I felt a unification of religions. 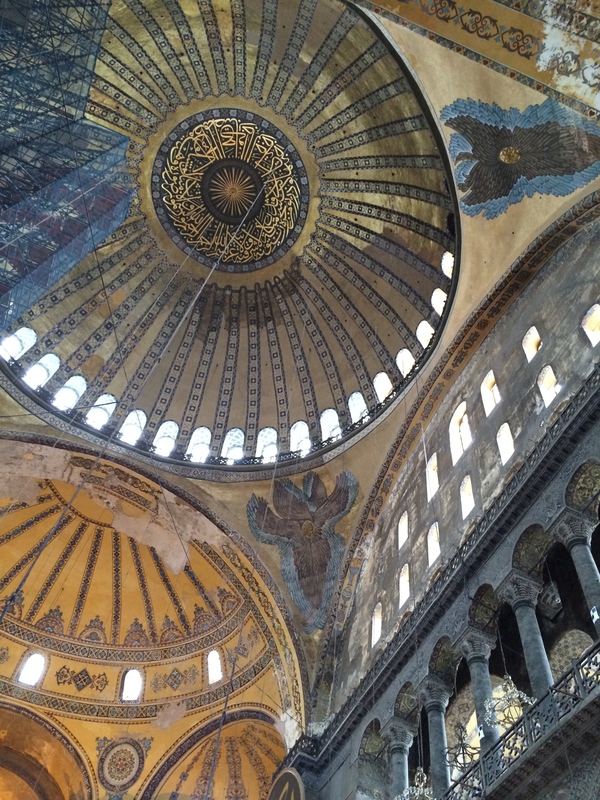 Archangels on the ceiling of Hagia Sophia. After lunch at the Topkapi Palace, we strolled between the Palace and the Blue Mosque. And then something unusual happened that Ceylan had never heard before – a duet seemed to arise between the two mosques. A voice rose from the minaret of the Blue Mosque and then appeared to pause and wait as the call to prayer continued from the minaret of the Palace. It continued this way, as if the Muezzin were praying together. We stood together in the rain, feeling the depth and beauty of the voices passing back and forth over us and we were enveloped within. The rest of the day was spent strolling through Istanbul’s streets. 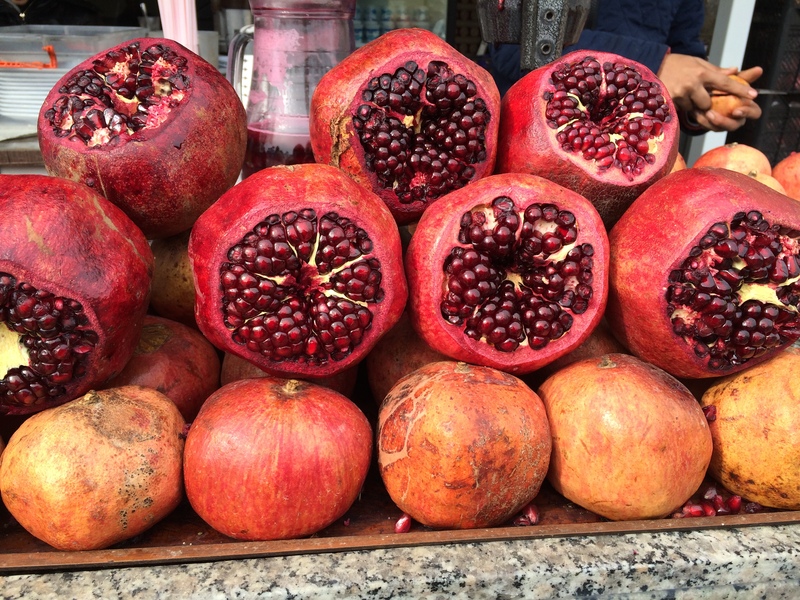 I took this photograph for my daughter because she loves pomegranates. 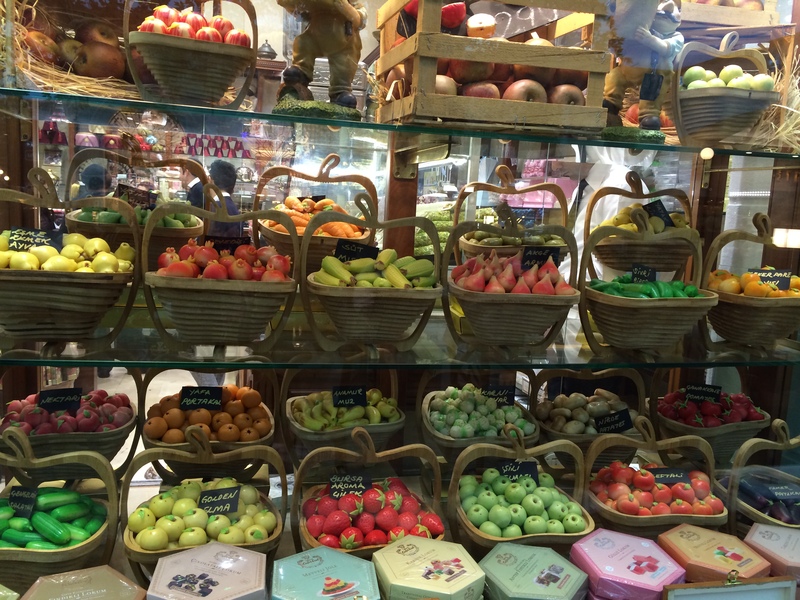 I took this for my son, because we share a pursuit of the perfect marzipan. Saying good-bye the next morning, I felt amazed by the love I felt pour from me and for me, and how a ten-day work experience could reach so deeply into my heart. I knew that I would miss everyone, and that my friendship with Ceylan would be a lifelong treasure. I travelled back feeling different and yet more like myself. Years ago doctors told me that I must stop my business career, and so I left it behind. I learned to embrace that change in direction because it opened me to explore and develop new sides of myself. But I now realized that aspects of my identity and self-confidence had inadvertently been left behind as well. In Istanbul I felt these parts of myself knitting together with all I have learned and become, and the posture that Rael has taught me took hold in a new way, from the inside, out. Rael guiding me into more perfect posture. I returned home from a journey across continents and with a heart full of gratitude to Rael, BASI Pilates, Ceylan, Cengiz Han, the entire Turkish team, and to my dear friend Sondra Karman without whom this experience would never have happened. Pilates brings movement to my body, strength to my spirit, and surrounds me with people who inspire me. I want to thank the entire Turkish team for their gracious support during my visit: Ceylan Ucgun, Assistant General Manager; Cengiz Han Ucgun, BASI Faculty, Owner of Bodynetworx; Seda Gulmez, Marketing & Corporate Communication; Husnu, Graphic Design; Mehmet, Sales; Ozgur, Chief of Production; Serkan, Production Technician; Atom, Engineering Assistant; Bayram and Onur who carried equipment, took things apart and put them back together so I could understand assembly; Fatma who always had fresh tea and snacks on my desk (I fell in love with genuine Turkish delights); Mr. Oktay Duran, Owner Duran Machinery; and Mr. Servet, Director of Engineering, who after meeting Ceylan was moved to leave retirement (as an internationally acclaimed aerospace engineer) and fulfill his desire to promote health and well-being in the world. 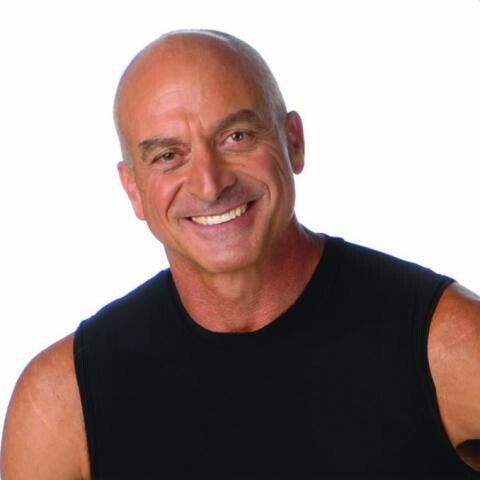 BASI Systems® new line of Pilates equipment will be introduced at the BASI Pilates® Mentor Program in Istanbul, August 13-15, 2015, where Rael Isacowitz will teach at a sold out event hosted by BODYNETWORX. North America call 866-922-2742 and for other territories +90 212 444 76 59. To learn more about BASI Pilates’ teacher education programs, visit www.basipilates.com or contact 949-574-1343, toll free 866-922-2742. The Sole of Pilates™ - Part One: The Miracle of Foot Rolling<< >>Mighty Medius: Make it strong for healthy movement! Wonderful, moving piece. The writer seems to have gotten to the deeper side of her experience. Good work Julie and what an “uplifting” experience ! How wonderful that the years of work you have put into developing your wide range of expertise brought you to this experience, and that your talents were seen, expressed, and appreciated. Shine on! an amazing story of your journey, beautifully rendered. so happy for you! In reading, I am struck, and moved, at how Life can present to us experiences which transform, when our inner self is open and alive. Every person responds to life’s offerings in his/her own unique manner, and it was a gift to be brought into your world and experience, along with you, a transformative time. The way you presented it and wrote it, the pictures, the descriptions, the presentation of the extraordinary people with whom you interacted, allowed me to really feel along with you, and to be brought into the experience. Truly a gift. Thank you!!! Hi Julie..its Barb Morrison…what wonderful things you have done for so many! !